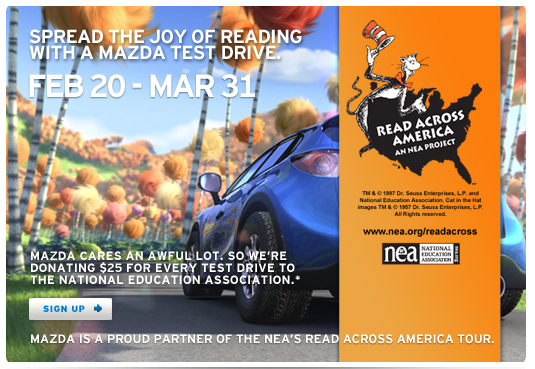 In a new cause marketing effort, the National Education Association (NEA), in partnership with Mazda North American Operations and Universal Pictures and Illumination Entertainment’s Dr. Seuss’ The Lorax, will launch a “Read Across America Tour – Driven by Mazda” starting February 21 to share the story of Dr. Seuss’ “The Lorax” with students and raise awareness for public schools in need. As the only carmaker to receive The Lorax’s honor of the “Truffula Tree Seal of Approval,” Mazda will power the reading tour by providing Mazda vehicles wrapped with the colorful graphics of the program. In addition, between February 20 and April 2, consumers test driving any Mazda vehicle at a local dealership will enable Mazda to donate $25 per test drive toward local public school libraries, up to a total of $1 million. The message of ‘The Lorax’ inherently lends itself to cause campaigns and brands are lining up to capitalize on the opportunity. The particular campaign combines two causes within a single effort (environment and literacy), which can be a challenge to execute and risks consumer confusion. I agree that the environmental message in the film was muddled but its heart was in the right place and the criticism it took didn’t hurt it any. It was very successful in terms of box office.